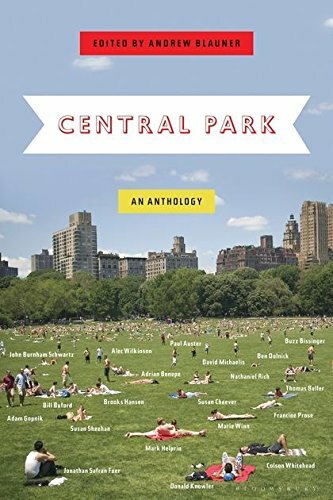 “When I was in college, I had a summer job, perhaps my most interesting summer job, as a pushcart vendor in Central Park,” begins Andrew Blauner in the introduction he as written for the new work he edited, Central Park: An Anthology. “It was an enormous pushcart that belonged to the Front Porch restaurant on the West Side of Manhattan. This was in the summer of 1976, the summer of the Bicentennial celebration, the tall ships, and fireworks, when disco was ascendant and A Chorus Line opened on Broadway. It was a summer when NUYC was mostly grimy and decrepit, with stifling subway cars covered in graffiti, but there were signs that not all was lost. . . . In celebration of Central Park (for no specific reason—no holiday or anniversary—but simply because the park is the emerald heart of New York), our editor has gathered together some of New York’s finest, when it comes to writers—journalists, novelists, memoirists, biographers, critics, purveyors of short fiction, and many, many writers for the New Yorker, even children of writers for the New Yorker—each apparently given the task to, in some creative way, explore what the park means to them personally. Most rise to the occasion, giving this collection a lovely golden gloss of memories buffed and displayed for our pleasure. Certain these quickly emerge. One of these, memories of animals in the park, gives us the two finest pieces in the collection. Wilkenson’s work features a lifetime of memories of his relationships with the turtles of Central Park, as well as positive proof that the water in Turtle Pond does not carry typhoid. There are a couple duds along the way. Second-generation author Susan Cheever still seems unwilling or unable to do much more than spread her Daddy issues around the page like finger paints. (Her father was novelist and New Yorker staple John Cheever, but still . . .) She manages to write more about the obligatory (for her) Westchester County than about the park. And Marie Winn’s open letter to Holden Caulfield, “About Those Ducks, Holden” is a bit cloying, if thankfully brief. But by and large, the writers voices ring clear, if a bit melancholy at times, in remembering New York, their youth, and Central Park, and the reader has as sunny a time in reading this as he would if out on the Great Lawn come June. This reader most certainly did, Mr. Blauner. He found them to be worthy of the bouquets that could be gathered from the bounty within Central Park itself. And that is quite an achievement.